Perhaps you have eclectic taste in decor or simply can’t make up your mind between contemporary and traditional. Maybe you only do modern but are feeling like the aesthetics need to be softened a little in your new baby’s room. Somehow Babycotpod has ingeniously bridged the gap between both styles by creating the Metro crib. 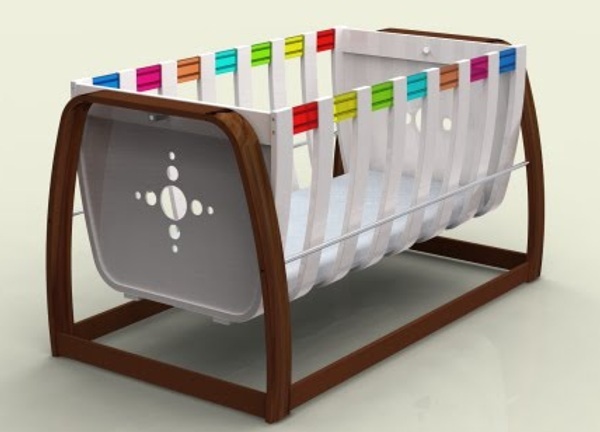 Designed for babies up to six months old, it mixes wood with white and then adds an injection of colour with coloured acrylic panels as a standout feature. There is a choice of light or dark wood and the crib can be gently rocked from side to side to soothe baby to sleep. The Metro will be available in August this year and the Cascara – which we featured here in June 2009 – at the end of the year. A full furniture range is also being developed! The Babycotpod Metro and Cascara will both be priced at £385 plus shipping.